This is an Accounting Service agreement, which can be used to hire the services of an accountant. In this agreement the two parties namely the client and the contractor will enter into an agreement in which the contractor will provides accounting services to the client for the amount of time the client specifies. You will need to mention the date on which this agreement is being made on. You’ll also need to mention the name of the accountant, the state which is licensed to the accountant and his address. You also need to provide details of the client like the legal name and the address. Both the parties agree on the effective date set in this agreement and a pre-set date of termination. Under the terms and conditions of this contract you will also need to fill in specific accounting services that the accountant has to perform for the client. Additionally the accountant according to his own discretion can also execute additional accounting services if the client requests. If this additional services not as described in the above-mentioned section it will be billed separately to the client. For the services performed by the accountant the client agrees to pay up the fixed amount in US dollars. And any other additional services will be charged at a separate hourly rate. The client will also need to reimburse the accountant for any incidental costs and expenses. These costs and expenses will be paid to the client on a monthly basis and will be paid within 30 days of the notice this it. The client will provide the accountant with complete information that is vital for the accountant to perform his services. All confidential information that is communicated during the term of this accounting service agreement will be held in complete trust by the accountant and will not give this permission to anybody else. This contract can be terminated by either party after submitting a written notice or it will be terminated immediately with the death of either one of the parties. Both the client and the accountant need to sign this agreement when it to be legally executed, if you are unclear out any of the points mentioned in this agreement you can seek legal advice. 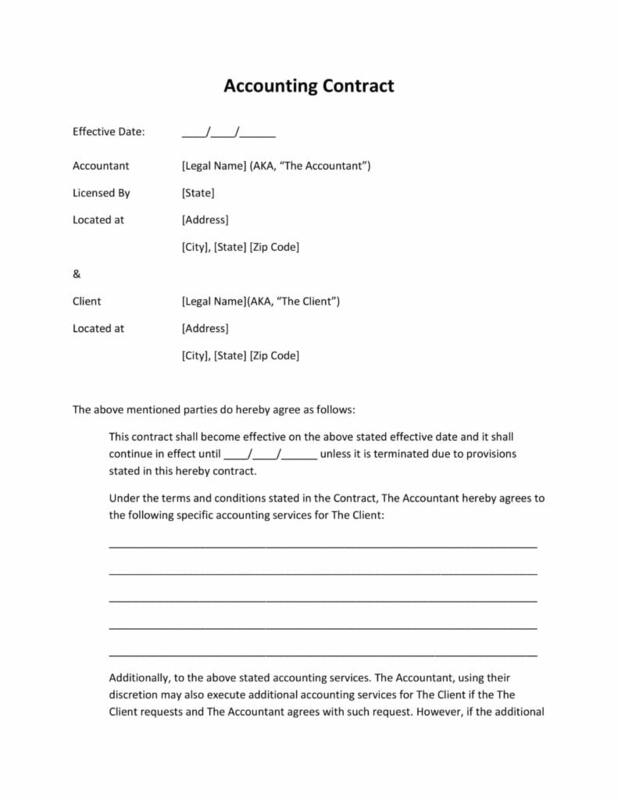 Click on the download link below to download this accounting service agreement template.